For many churches and service organizations, the end of the school year also marks the end of volunteer terms of service. While many volunteers plan to continue on in their positions, some will be stepping down. 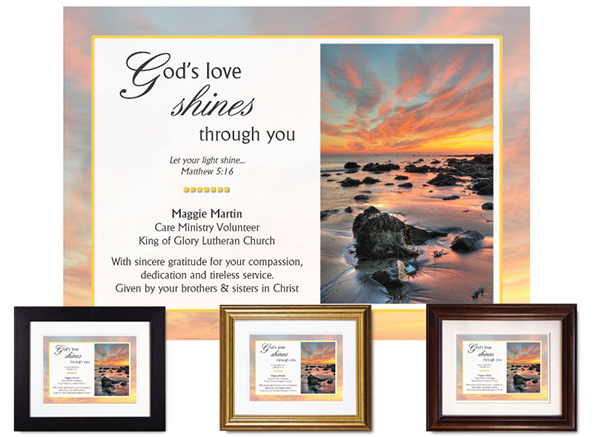 If you’re looking for a way to convey thanks in a tangible way to those who will be completing their service, our personalized appreciation plaques make lovely keepsakes. Whichever design you choose, you’ll be able to customize it specifically for the recipient. Each piece is created using premium inks and paper as well as museum-quality matboard. These will look just as good years from now as the day you present it. There’s a wide selection: dozens of plaques! Click on the links below to view the collections.